MOUNTAIN HOME AIR FORCE BASE, Idaho -- Capt. 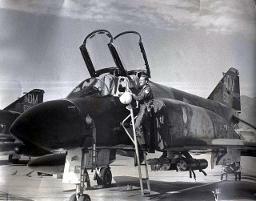 Stephen A. Rusch climbs into the cockpit of an F-4E Phantom II aircraft. Captain Rusch served as a weapons system officer during the Vietnam War. 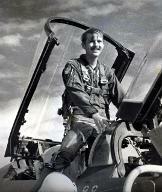 He was assigned to the 366th Tactical Fighter Wing’s 4th Tactical Fighter Squadron at Da Nang, Republic of Vietnam, when his plane went down during a combat mission. His remains were identified on Nov. 27, and he was returned home for burial on Nov. 30. (Courtesy photo). It's been 40 years since the "Phabulous Phantom" first took to the air on May 27, 1958. The F-4 Phantom II aircraft, which still flies in defense of 8 nations, was retired in 1996 from U.S. military forces, ending a record-studded 38-year career. of flying as a ground-support bomber for the U.S. Marine Corps. The aircraft flew every traditional military mission: air superiority, close air support, interception, air defense suppression, long-range strike, fleet defense, attack and reconnaissance. It could fly short training missions or 4.5-hour sorties as a Wild Weasel in search of anti-aircraft defense systems. It starred in both the Vietnam War and Operation Desert Storm with a record of 280 air-to-air victories and the destruction of more than 200 anti-aircraft sites. The Phantom was the first multiservice aircraft, flying concurrently with the U.S. Navy,Air Force and Marine Corps. 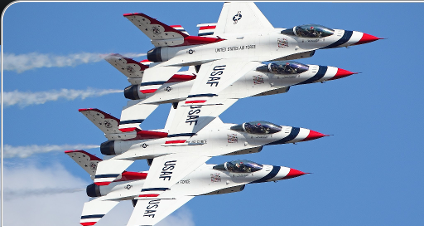 It is the first and only aircraft ever to be flown concurrently by both the Blue Angels and the Thunderbirds. It has been flown by the defense forces of 11 other nations: Australia, Egypt, Germany, Great Britain, Greece, Iran, Israel, Japan, South Korea, Spain and Turkey. The last F-4s in active U.S. operational service were retired in 1996. Yet by the late 1990s, having been upgraded in a number of air forces, more than 1,000 Phantoms still flew worldwide. It's only been 95 years since the Wright Brothers first took humans into the skies, and the F-4 Phantom II has been flying more than 40 percent of those years. From 1958 to 1979, when the production line stopped, a total of 5,195 F-4 Phantom II aircraft were built. Of those, 5,057 rolled off the McDonnell Aircraft (later McDonnell Douglas) production line in St. Louis, Mo. The last 138 were built under license by Mitsubishi Aircraft Co. in Japan. The 21-year production run was the longest on record until surpassed by the F-15 Eagle, which has now been in production 26 years (1972-98 and counting). 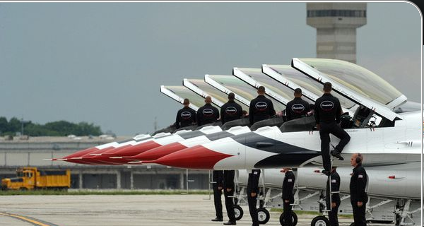 Of the 5,057 built in the United States, the U.S. Air Force took delivery of 2,874 aircraft; the Navy and Marine Corps, 1,264; and international customers, a combined total of 919. The Phantom still holds the record for the largest production run of any supersonic fighter built in the United States. The pilots and crews who worked with the aircraft called it many nicknames, but most of all they praised it as a workhorse, an aircraft you could count on, an aircraft that did it all, and an aircraft that got the job done and got you home again.